Over the Christmas break, I got my hands on Arlott on Wine (1986)—a collection of newspaper articles by the British wine (and cricket) journalist John Arlott (1914–1991). What struck me when reading the book was that still in the 1980s he used the term “Moselle” for wines made in Germany. Today most, if not all, texts in English about the German section of the river, and especially its wines, use the German form, Mosel. This made me curious to find out when the shift from “Moselle” to “Mosel” took place, and generally more about English place-names in Germany. So, I decided to consult some other books. One could argue that English tourism in Germany had its starting point in 1845—the year of Queen Victoria’s visit to the Rhine Valley, which became famous for the promotion of the name Hock. A few years earlier, Mary Shelley, the author of Frankenstein, traveled along the Moselle and Rhine. Once home, she published her book Rambles in Germany and Italy. Shelley traveled on the Moselle and visited Trèves (Trier), Coblentz (but not Coblence for Koblenz), and then on the Rhine to Mayence (Mainz), however, she did not visit Cologne (Köln). About half a century earlier, during what the Germans call the Franzosenzeit (the French period, 1794–1815), the territory west of the Rhine was annexed to France and many cities were then given French variations of their names. Shelley’s use of the French forms is actually not surprising, but rather normal, especially when you bear in mind that she did not speak German and therefore communicated with the locals in French. In 1913, the Englishman Charles Tower published his work titled Along Germany's River of Romance, the Moselle, which covers the entire river from its spring in the Vosges Mountains to Coblenz, the then German form. Only in 1926, it was changed to Koblenz. He, however, also visited Trèves. Between the wars, the London wine merchant Hugh R. Rudd (1882–1949), who was an expert on German wine, published his Hocks and Moselles (1935). In the introduction, he writes about Trier but adds “or Trèves” between brackets at the beginning. Throughout the book, he uses contemporary German forms except for Moselle and Palatinate (Pfalz). In his 1957 German Wines, Frank Schoonmaker also kept Coblenz and Moselle, and reintroduced Hessia for Rheinhessen, but dropped Trèves altogether as did O.W. Loeb and Terence Prittie in their Moselle from 1972. As I mentioned in the beginning, Arlott used the form Moselle in the 1980s, but other English authors, like George Rainbird, also used this spelling. The big change happened in 1995 when Stuart Pigott and Hugh Johnson published their Wine Atlas of Germany. There we find not only Mosel, but also Mittelrhein instead of Middle Rhine, Pfalz instead of Palatinate, and Franken instead of Franconia. It would be interesting to hear from the authors if this choice of style was made on purpose. Pigott and Johnson’s book seems to have had a great deal of influence, because most wine writers today use the German form when writing about the river and its wines in English. But the entry in Encyclopaedia Britannica online speaks about the “Moselle River” and even “the famous Moselle wines” in Germany. Per Linder works in asset management; he lives in Luxembourg with his wife and two children. First, I looked through some of my pre-1995 books on German wines, and it appears to me that ‘Moselle’ was gradually giving way to ‘Mosel’ well before Johnson and Pigott’s seminal 1995 book. 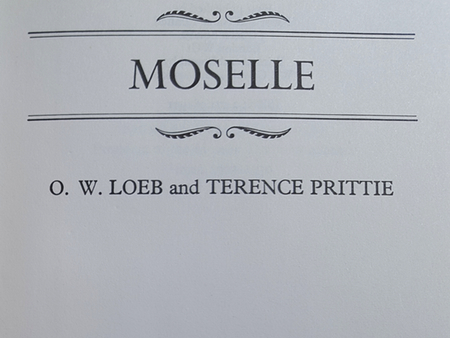 Fritz Hallgarten’s “A Guide to the Vineyards Estates and Wines of Germany” (1974) uses both spellings, although ‘Mosel’ is used far more frequently than ‘Moselle’. (On the other hand, Hallgarten refers to ‘Rheinhessia’ several times.) Ian Jamieson’s “Simon & Schuster Guide to the Wines of Germany” (1992 printing) only uses ‘Mosel’. For what it’s worth, Hugh Johnson wrote the forward for this book. On the American side, the 1989 edition of “Parker’s Wine Buyer’s Guide” never uses the Moselle spelling. I would be curious if Terry Theise or Rudi Wiest ever used ‘Moselle’, and if so, when they switched over. My guess is that the spelling ‘Moselle’ was never as ingrained in the newer wine culture of the United States as it was in the UK lexicon, despite Schoonmaker’s highly regarded writings. Then again, we also labeled low quality Central Valley jug wines as “Rhine Wine”. Of course, the name Hock is still used by the likes of Waterford for a style of wine glass. Going off on a slight tangent, Hugh Johnson’s 1998 edition of his Wine Companion spells Terrassenmosel as Terrassen Mosel. Many thanks for your input. I share your conclusion that this was probably a UK/US thing till the early 1990s. Again, it would interesting to hear why this choice was made. Hugh Johnson is on the latest episode of “I’ll Drink to that”. He speaks about German Riesling around 19:30, and clearly pronounces the name of the river and the wine with a stress on the second syllable, i.e. French style, written Moselle. Thanks, Per. Hugh Johnson does make this distinction at the 19:40 mark of I’ll Drink to That! Over this Christmas break, I have watched Hugh Johnson’s TV mini-series “Vintage: History of Wine” from 1989, which he mentions in the “I’ll Drink to That” interview. From 1:20:00 in volume I, he reports from Trier and then pronounces, unsurprisingly, the name of the river as mentioned above. A few minutes later he talks to the Geisenheim viticulturist Dr. Helmut Becker; and Becker, surprisingly, pronounces the same way as Johnson, even twice.